Deanna Pilling, a dear friend and fellow member of the Sunshine Coast Spinners & Weavers Guild, has designed a series of special blankets with stripes that represent different areas of the Coast. For her Pender Harbour throws, she has chosen to use mushroom colours. 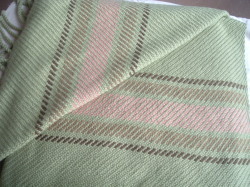 This blanket was commissioned as a wedding gift, specifically to honour the colours of the rainforest; the pink stripe was obtained from lobster mushrooms, while the tan and brown stripes came from dyer’s polypore. You can read more about Deanna’s lovely weaving studio at http://www.labellecottage.com/Weaving.html.